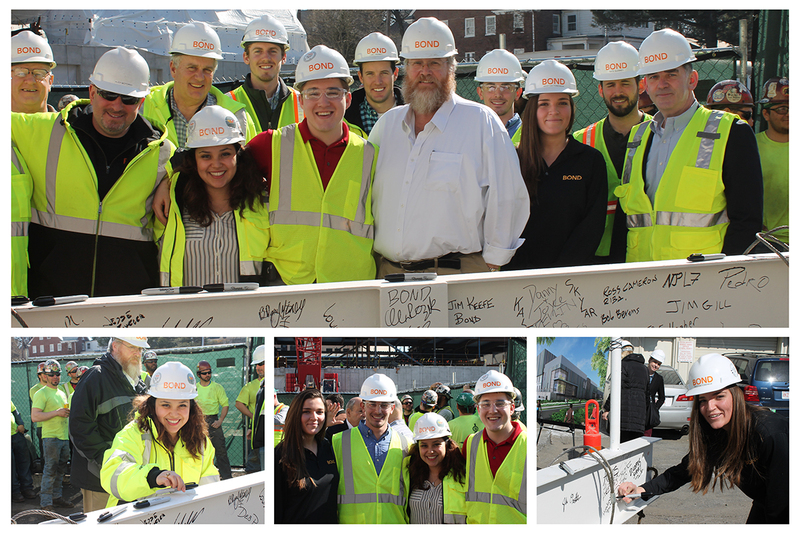 (Boston, MA) – BOND, the Northeast’s premier building, civil, utility and energy construction firm, recently celebrated the topping off ceremony for Boston University’s Theatre Center. The ceremony marked the last steel beam raised on this 75,000 square foot facility. It was attended by members of the University, the BOND project team and design partners including Elkus Manfredi Architects and Vanderweil Engineers. Located on the Charles River Campus, the new multi-functional facility will feature a black box theater with seating for 250, high bay spaces for scenery and prop construction, costume shops, faculty offices and teaching studios. A two-level subsurface parking garage and adjoining parking lot will provide space for 286 vehicles. A beautifully landscaped plaza on Commonwealth Avenue will provide a welcoming focal point along with landscaped buffer zones along Essex and Dummer Streets. The project is on-track, within-budget and anticipating LEED Silver certification. Phase 1 occupancy is slated for mid-August 2017 with completion by November 28, 2017.